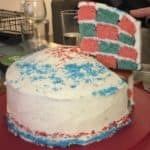 A checkerboard cake is impresseive and tasty. Try your hand at making one with a few simple steps using concentric cake rings. I read a lot of food blogs, and their Pinterest-perfect presentations often inspire and challenge me. I often try (and sometimes fail) at replicating their recipes, but there’s always another recipe to attempt. One such recipe was for a checkerboard cake from Sally’s Baking Addiction. I was intrigued as to how it was made, and when I saw that the steps looked easy enough, decided to give it a go. And since my daughter & future son-in-law were hosting a Super Bowl party, that seemed reason enough to plow ahead. (Regarding the Super Bowl, I live in Boston…don’t ask & don’t gloat!). A checkerboard cake is a cake layered with alternating colors, each layer formed as a bull’s-eye of those alternating colors. The trick is to make the concentric rings of equal widths so the checkerboard comes out looking even (more or less, depending on how tall the cake layers rise), so for a standard 9-inch cake layer, you’ll need to cut 6-inch and 3-inch circles. I ordered a relatively inexpensive 6-inch circle cutter from Amazon (I already had a 3-inch circle cutter for making biscuits, but you can order one here). Next, you carefully separate the cake circles and put the middle ring from one color inside the outermost ring of the other color (the center circle matches the outer ring). When you stack the layers (again, alternating the colors), the checkerboard effect will show when you slice into the cake. 1 Tbsp vanilla extract, yes, Tbsp! Preheat oven to 350°F (177°C). Grease and lightly flour 4 9-inch round cake pans. Whisk the flour, baking powder, baking soda, and salt together in a large bowl. Set aside. Using a handheld or stand mixer fitted with a paddle or whisk attachment, beat the butter and sugar together on high speed until smooth and creamy, about 3 minutes. Scrape down the sides and up the bottom of the bowl with a rubber spatula as needed. On medium-high speed, add 1 egg at a time, beating well after each addition. Beat in the vanilla extract. Scrape down the sides and up the bottom of the bowl with a rubber spatula as needed. There will be 8 cups of batter total -- transfer half of it to another bowl. Stir in 1/3 cup sprinkles into half and the food coloring into the other half. Pour/spread batter evenly into prepared cake pans. Bake for around 24-25 minutes or until the cakes are baked through. To test for doneness, insert a toothpick into the center of the cake. If it comes out clean, it is done. Allow cakes to cool completely in the pans set on a wire rack. The cakes must be completely cool before frosting and assembling. Trim cake tops to level them. Using a 6-inch round cookie cutter (it's large! ), cut a circle into each cooled cake. Using a 3-inch round cookie cutter, cut a circle out of the 6-inch circle. You will have 4 3-inch circles, 4 6-inch circles (the outlines), and 4 9-inch circles (which are just a thin outline of cake since the centers are missing). In a large bowl using a hand-held mixer or stand mixer fitted with a whisk or paddle attachment, beat the butter on medium speed until creamy, about 2 minutes. Add powdered sugar, cream, vanilla extract, and salt with the mixer running on low. Increase to high speed and beat for 3 full minutes. Add more powdered sugar if frosting is too thin, more cream if frosting is too thick, or a pinch more of salt if frosting is too sweet. Place one blue 9-inch outline of cake onto a serving plate or cake stand. Fill with a funfetti 6-inch circle, then a blue circle. Spread frosting evenly on top. Repeat with next layer: 9-inch funfetti filled with 6-inch blue then 3-inch funfetti. Spread frosting evenly on top. Repeat next 2 layers. Spread the remaining frosting all over the top and sides. Decorate top and sides of cake with extra sprinkles, if desired. Refrigerate the cake for at least an hour before slicing and serving. The time in the refrigerator ensures a neater cut! Cover and store leftover cake at room temperature for 1-2 days or in the refrigerator for up to 1 week. Buttermilk Substitution: you can use whole milk mixed with 1 1/2 teaspoons of white vinegar or fresh lemon juice. Using Sally’s recipe for the from-scratch cake, I ran into a couple of relatively small problems (all my fault). I added an extra 1/2 stick of butter to the cake (I confused the amount for the cake vs. the frosting…just goes to show the importance of reading the ingredients list carefully!). This mistake had the effect of making the cake batter have a curdled look to it (which at the time I noticed but didn’t understand why or how to fix…a quick internet search later said I could have just added a bit more flour. Lessons learned…). The result was baked layers that were a little oilier with a wider crumb (i.e. the pattern of holes in a baked product…you can see the wider holes in the cake layers). Also, the batter color was more yellow than white, so when I added the food coloring to the separate bowls, I got a sort of rose & teal instead of the red and blue I was shooting for. Updated 2/2019: I discovered Bake-Even Strips that insulate the cake pans as the batter bakes, thus keeping the cake layers even. I used it for the Black & White Cookie Cake to great effect. It avoids the “droop” of the layers. Who knew? I work at play. I’m a play explorer!